How many of us, when we were kids, did that experiment where we planted beans, or had them germinate between paper towels? That experiment was a great gateway to gardening in so many ways: bean seeds were big and easy to handle, germinated quickly, and grew by leaps and bounds once they got going. I remember bringing my bean seedling home in a paper cup and planting it in our back yard. These vegetables all have fairly large seeds and germinate quickly. Kids will likely most enjoy growing beans and pumpkins, but any of these are great for young gardeners. The annual flowers listed here have seeds that are not too tiny, making them easy for kids to hold and sow easily. They also germinate fairly quickly, though the morning glory and hyacinth bean vine seeds may require a little more patience. Annuals are best. Kids get almost immediate gratification, since annuals tend to germinate quickly, and will flower and/or produce fruit within a few months. Perennials require more patience -- not a bad lesson to learn, but also not one that will necessarily turn your kids on to gardening! Expect imperfection. Rows will not be straight. You will have clumps of plants, then long stretches of nothing. The plants don't care how straight or neatly they're planted, and neither should we. All that matters is that the kids get to plant seeds and watch them grow. Congratulate them on a job well done and enjoy watching all of those plants mature. Water regularly, but don't drown seeds. The best tool I've found for this is a spray bottle, filled with water. Kids love spraying things; give them a spray bottle and let them water the plants. Just don't be surprised it they start spraying a few other things (and maybe people) along the way! 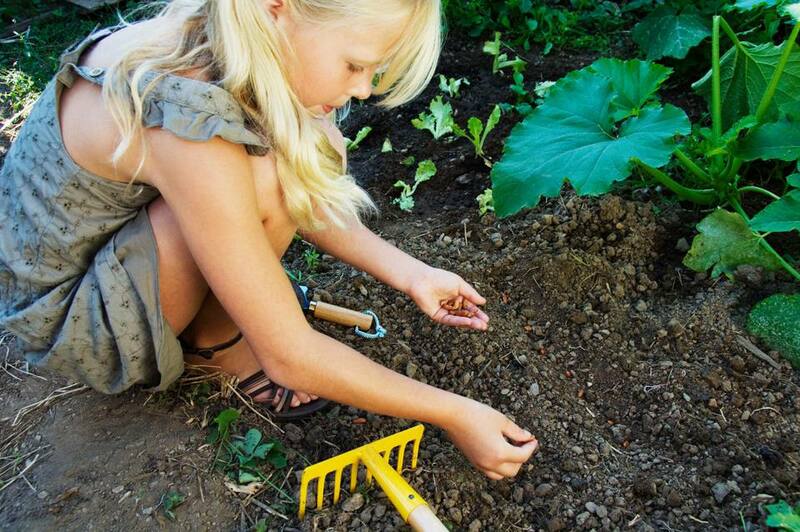 Whether you're growing a pot of radishes or a bed of towering sunflowers, getting your kids in touch with nature in your garden is an experience they won't soon forget!